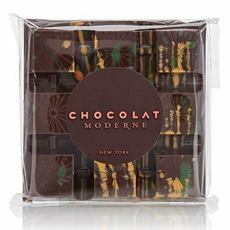 Our favorite chocolate bars have long been everything in the Avant Garde Bars line from Chocolat Moderne. We discovered the company in 2005 and have been nibbling away since. Joan Coukos’chocolates, made with Valrhona chocolate, are always innovative in flavor and design. Even if we weren’t so beguiled by the Jackson-Pollack-like hand-painted designs on the bars, we’d still go for the flavor. At $8 each, these are wonderful stocking stuffers. Give an assortment of flavors for a larger gift. If you’re in New York City, the retail shop is open Monday through Saturday from 12 to 6 (7 West 20th Street, Suite 904). Bazaar Bar: Dark chocolate bar filled with house-made almond marzipan blended with creamy white chocolate ganache. Blood Orange Bergamot Bar: Dark chocolate bar filled with caramel flavored with fresh blood orange juice and scented with oil of bergamot. Gunsmoke Bar: Milk chocolate bar filled with caramel laced with smokey mezcal and sea salt (our current addiction). Lemon Up Bar: White chocolate bar filled with tart caramel made with fresh lemon juice. Peanut Pizzazz Bar: Dark chocolate bar filled with salted peanut and milk chocolate praliné blended with flecks of caramelized sugar. Smoked Sea Salt Bar: Dark chocolate bar filled with sea salted caramel and finished with crystals of smoked Welsh sea salt (the different types of salt). Solbeso Mi Mucho: In Valrhona’s new Dulcey chocolate, a.k.a “blonde” white chocolate made by toasting the milk powder before making the chocolate (somewhat akin to the caramelization of dulce de leche). It’s filled with caramel blended with sea salt, unsweetened chocolate and Solbeso, the first spirit to be distilled from the pulp of cacao. Spicy Hazelnut Gianduja Bar: A Dulcey chocolate bar filled with dark chocolate hazelnut gianduja blended with sea salt, chipotle, ancho chili and cinnamon. Cranberry Orange Bar: Dark chocolate bar filled wtih soft caramel made with cranberries, essential oil orange and a touch of morello cherries. Gingerbread Bar: Dark chocolate bar filled with caramel infused with gingergread spices. Peppermint Stick Bar: Dark chocolate bar filled with rich dark chocolate caramel laced with peppermint. Pumpkin Pie Bar” Dark chocolate bar filled with milk chocolate caramel blended with organic pumpkin purée and aromatic pumpkin pie spices. Peanut Pizzazz Bar. Smoked Sea Salt Bar. Sobeso Mi Mucho Bar. 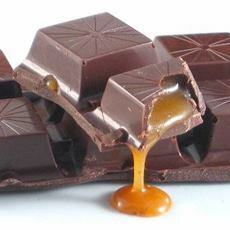 The caramel inside each square (all photos courtesy Chocolat Moderne). Artisan chocolates often sell out for the holidays. 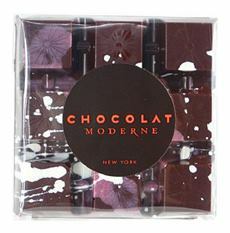 Head to ChocolatModern.com.